“Playing with Food: Fun with Farm Facts for All Eaters!” stimulated the conversation for the Urban Land Institute-NW’s Center for Sustainable Leadership cohort on the bus from downtown Seattle to Taylor Shellfish’s operation on the shores of Samish Bay in Skagit County this past October. In a one and a half hour motorcoach ride, the 25 students were transported from city bustle to a county that is passionate about remaining a strong, vibrant farming and food-producing hub. What does it mean for this part of Puget Sound to be appreciated as a bioregion, with an emphasis on agriculture, was the day’s overriding theme. The link between city folks and country residents was emphasized as essential to foster, respect, and cultivate. Without our rural counterparts nurturing the soil, growing our sustenance, and bringing it to market, the city would be hungry. Having locally grown and harvested food is a key ingredient to sustaining a resilient community thereby melting the urban–rural divide. Just as cities need food, rural farmers need eaters–a symbiotic relationship is built. Beginning with a crisis, the organization now drives the work to ensure that the Skagit Valley continues to be an agricultural hub in perpetuity. Currently there are 108,000 acres of land in farm production, of which 98,000 acres are zoned for agricultural use, but less than 10% of the food-producing ground is permanently protected with conservation easements. Despite 90% of the farm properties being agriculturally zoned, farmland is still highly threatened with non-agricultural uses. Farmland is cheap, flat, and seemingly ready for non-farming purposes. 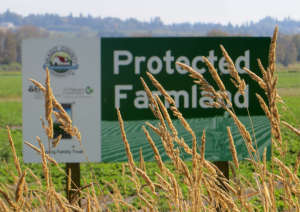 Salmon habitat restoration (80 acres), soccer fields (120 acres), wetland mitigation bank (100 acres), wildlife habitat (100 acres), large lot farm estate (40 acres)–these are just a few of the pressures on farmland. Skagitonians’ mission is to shield all farm ground from conversion to others uses, as it would be a “tragedy of the commons” to the vital resource that feeds us. One of the reasons large blocks of land is optimal for efficient agricultural production is the biological necessity to rotate crops between different fields and not growing the same crop in the same ground in consecutive years. In my own yard I experience the lack of rotation in my Brassicas (kale, chard, ornamental kales, etc.) which are now aphid infested every season. Granted, I could douse them with pesticides, but because I only have a 5,000 square foot lot, I must instead eliminate kale production. The aphids will not find a home on my lot and leave. 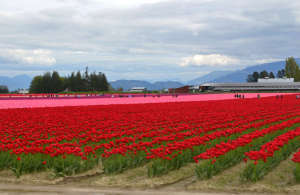 The Skagit farmers, on a much larger scale, similarly must rotate their crops—potatoes, corn, grains, strawberries, tulips, seed crops, cover crops, and others—to sustain a viable agricultural system, keeping the soil healthy and reducing the need for excessive use of herbicides and pesticides. An example are grain crops, which are a necessity in rotations because they have deep roots, which help with soil friability and are nitrogen fixing to support future crops. The Skagit’s top crop—red and white specialty potatoes—requires 36,000 acres or one-third of the entire valley’s farm ground every year to retain an economically, sustainable business. Only 9,000 acres or one-quarter of the “potato acreage” is planted in potatoes each growing season, while the remaining “potato acreage” is rotated among the other crops. There are at least ten different red potato growers in the Skagit. Check where your potatoes come from this holiday season. 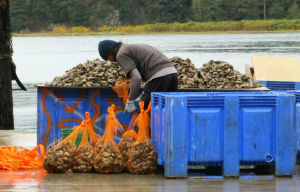 Having just toured the shellfish farm and feasted on raw oysters, oyster stew and steamed clams and mussels for lunch, Bill emphasized the importance of the superb water quality necessary to sustain Taylor Shellfish’s $60 million family run business which sells seafood products to local and worldwide markets. Bill expressed concerns on the impacts from climate change which are acidifying and warming the ocean and estuarine waters that provide the food that feeds us. One class participant had an epiphany and linked the importance of his jurisdiction’s wastewater treatment discharge on the health and well-being of his lunch! Linda stressed the significance of local food production, as an important measure of a region’s sustainability. Can Puget Sound feed itself, if for some reason we were unable to import food from California, Mexico, or Arizona? Typically, Puget Sound grocery stores only have a three-day, non-local, food supply. The dairy system needs hay, to feed the cows, to produce milk. 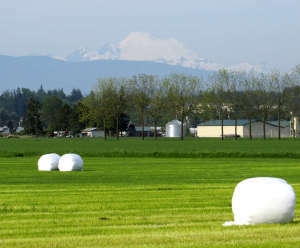 Hay does not have a high profit margin and hayland is highly threatened in Snohomish County. Jessica spoke of her personal choice to go back to the land, to grow food. According to Nash Huber, Nash’s Organic Produce, seven (7) years are needed for a carrot field’s rotation cycle. The “tragedy of the commons” would be to squander the vital Skagit Valley farmland resource, that is so critically important to providing an essential ingredient to human life—FOOD. Learning more about the local agricultural system creates a deeper appreciation for the importance of our farmers, the land, and the food they grow and the value of real estate professionals developing great cities.